Are you sick of winter? Our winter here in NC has been pretty mild, but that point from late January to late February is a big ol’ grumpy time for me. Much of the northeast is seeing record snowfall, and for me at least, that means oatmeal. Not those dusty packets of super sweet instant oats, but rich, hearty toasted oats. Toasted oats? Yes, indeed! Sometimes I read foodie articles and marvel at my own lack of creativity or insight. 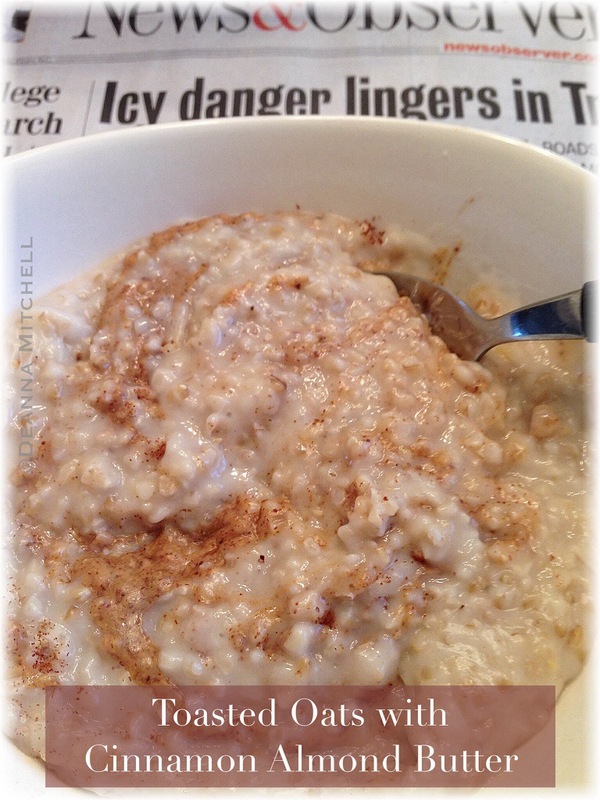 I read an article recently that revolutionized my oatmeal making, and I kept thinking, “why didn’t this occur to me?”. The article asked why, when we toast rice and other grains prior to cooking, we don’t ever toast our steel cut oats before making oatmeal. Toasting brings out wonderful flavor in nuts and grains–what would risotto be if we didn’t toast the arborio rice prior to adding the stock? I know right? I decided a dark, cold, rainy morning was a good time to experiment with this technique. I don’t think I will ever make oatmeal another way again. Oh. My. Goodness. Toasting the steel cut oats gives the oatmeal an amazing depth of flavor and a wonderful nuttiness. And since grumpy winter mornings call for going a little over the top with our breakfast, I added some cinnamon and almond butter to the oatmeal for a protein-packed, super healthy start to the day. This is crazy delicious. I want to eat this all the time.